I didn't know what to make for dinner this evening, and usually I have a at least a couple ideas in my head for the week..I didn't want to fall back on pasta or tacos/burritos, because they've been dominating my past couple weeks. Naturally I wanted to use what I had in the house, and I knew I had fresh broccoli and carrots, and then I thought of how vegancore and amygeekgrl had both posted amazing looking peanut sauce dishes lately - and I knew what I wanted. I also couldn't keep the thought of spicy food out of my head today, so I kept spicing up my peanut sauce. I quickly marinaded some Trader Joe's organic tofu in tamari, agave nectar, crushed garlic and a dash of almond oil. I cooked it till brown on both sides in canola oil, more crushed garlic and some red pepper flakes. After I deemed it brown enough I removed it from the pan and layed on paper towels. 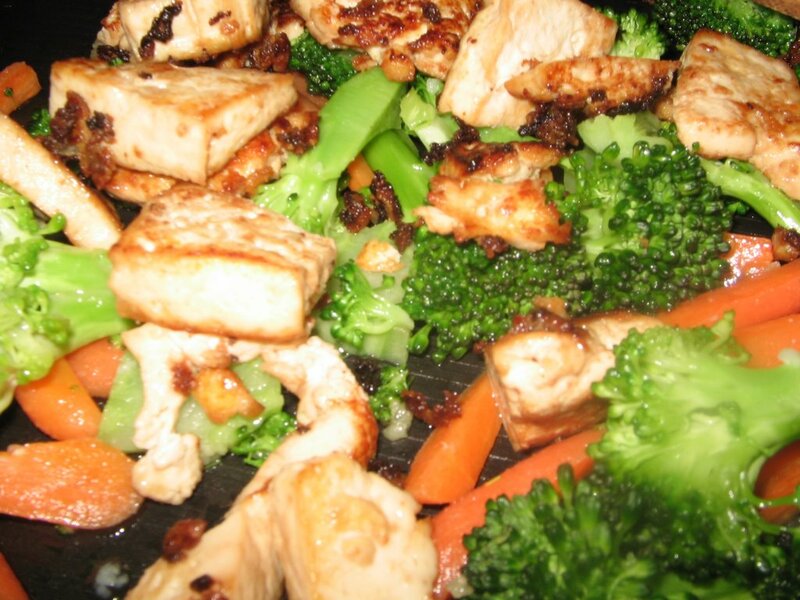 I then added more crushed garlic to the oil and added chopped baby carrots, broccoli florets and broccoli stalk. 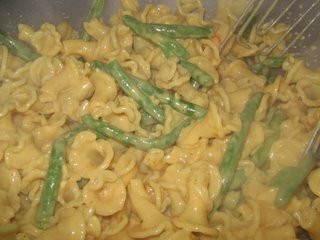 I cooked these with the lid on for 5-8 minutes on medium. Meanwhile, I made a peanut sauce of peanut butter, rice vinegar, agave nectar, cayenne pepper, tamari and pineapple-coconut juice I had in the fridge. Next time I hope to have just coconut milk, but I wanted to use up the juice, it wasn't a hit in the house. cayenne pepper pinches, to desired spice! *of course, add ginger if desired, I didn't have any powder but I'm not a big fan anyway. 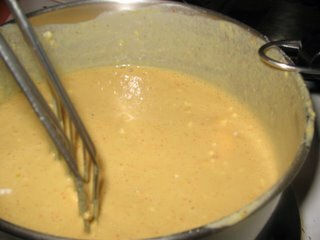 I whisked it together on medium/low heat for a few minutes, and sat on very low heat till I distributed onto my sauce. 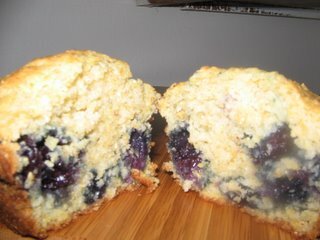 These blueberry corn muffins are becoming a weekly tradition. omg, now i'm totally craving some of your peanut butter sauce. that looks awesome. 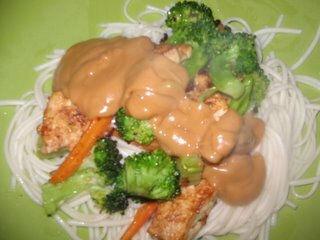 I love peanut sauce! Mmmm and muffins! Mmm, peanut sauce. Peanut sauce is lovely in any form. It can do no wrong. Interestingly, your soba noodles are a different color than mine. Mine are brown. The recipe for the corn muffins is actually here: http://www.theppk.com/recipes/dbrecipes/index.php?RecipeID=68 The recipe I usually use is a teeny bit different, it's from the VWAV book, but I had lent mine to a friend. The book recipe I believe has only 1/4 cup sugar and no vanilla, and adds blueberries. I did cut down the sugar, add bluebs and used only 1/8 tea. vanilla. vegancore- I'm pretty sure mine were soba, but I have a bunch of soba and udon and maybe even some other brown and white and buckwheat japanese noodles in my cabinet and this happened to be a half bag I had that I had waiting to be used..so they could very well be a different type of japanese noodles..still good though! though glaringly bright white. Hi there! Yes, it's the Value Village on 82nd that has the sale on the 20th. You cut down the sugar in the muffin recipe? I recently made VwaV's Lemon Poppy Seed muffins (also called for 1/4 cup of sugar) and I found them not sweet enough at all...was planning to add at least 1/2 cup next time. What amount did you use? I'm planning to make a quick peanut sauce tonight, from Vegan World Fusion Cuisine (beautiful cookbook)--can't wait! Thanks for the inspiration and pictures! Ms. Mercedes- I have looked through that cookbook, oh my gosh it is gorgeous. I've had kuri squash carrot soup at Blossoming Lotus in Portland and that too, was gorgeous looking and tasting, such a clean delicious soup. The lemon poppy ones are soon on my list, I finally bought poppy seeds this past weekend for the first time. I cut down on the sugar in the online recipe, the recipe in the cookbook has 1/4 cup, and the online one had 1/2 cup. I think the blueberries make them sweet and my boyfriend and I trying to cut down on sugar. Let me know how the lemon muffins are with sugar quantities - that's something I would want sweet. i just read double dinner "pilates" - that's my subconscious desperately trying to tell me something. will bake cookies and make corn muffins today, they look so good. and uuuuuuuh, now i know what to do with the green beans. thanks for the inspiration!! !